Our species has a shocking habit … to wait for the wall to fall on its head before finally deciding to repair it (or better) to invent something new, like … an open wall, allowing light and lives to enter in. 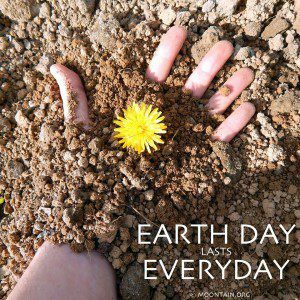 We even invented special days so we don’t forget x or y causes … How could we forget the Earth we live on ( and thanks to ) ?! This is an everyday concern that should lead our thoughts and actions anyway. This link can’t be broken but seems easily forgotten. How crazy it is, to still adopt behaves conducting to more deaths and dramas, knowing pretty much everything about the consequences but not caring concretely. It requires actions to participate to such a positive Circle, but only passivity to let the negative cycle we are in, rolling. I remember writing a post last year at the same date and i can only see so few has changed ( except for the climate ) since. This is quite obvious we are heading into the falling wall faster everyday. Of course, all is not dark as more and more people are now investing time to promote an alternative. But too many times the reason for a change is money ( to save ) related. As long as it will be the motivation, it will not work, because it is more about a consciousness awakening now if we really wanna protect biodiversity, present and future. Sure, some will argue, change is in the air, this is the nature of Life and we agree, except not at this rate, plus this is the perfect opportunity to experience common empathy and test our capacities of acting together for something positive. There are so many resources now on the internet not only to keep you informed but also to give you tips to help you to decrease your environmental impact, use it ! On a personal note i will just say a couple of things. It is not about pointing our finger to x or y individuals or even waiting after our governments to do something, we can’t blame anyone anymore, there is no such time left for that, time is for action. This is a do or die situation for real, not science fiction, this is happening, in the present. How crazy … we make our selves breathe polluted gases with cars all around us, in front of our mouths literally, we poison our food, our soil, our future generations, and i am sad to see this is mainly due to one thing, the money factor, a symptom of the thirst for an illusionary power ( through that money ). Are we, as a species, still this low on the evolution map ?! Stop the waste, and follow Nature’s example … listen to your inner voice about it, it will always show you the way. Turn off the commercial noises and then you will be able to hear it. Nothing but us can impose our selves something, it is our choice we need to renew. Observe what feels good or not and then do it. A seed gives a tree, offers a fruit and feeds lives, … then the fruit falls down and feeds the soil back to re start the process. This is this exact same process we need to be a part of again. To humbly accepts our so called progress was not the good way so we can change it.